Being married to someone from another country often means the foods you remember from your childhood are completely foreign to your husband/wife. Whilst I grew up looking forward to fairy bread at parties, Jesse thinks that sprinkles and bread should never be seen together and whilst Jesse remembers fairs and funnel cakes, I wondered why on earth someone would want a cake in the shape of a seldom used kitchen accessory. Over the eight years we've been together, we've both learnt a lot about the different foods of each other's childhood - and I've had lots of fun recreating Southern dishes in my own Southern In Law way. 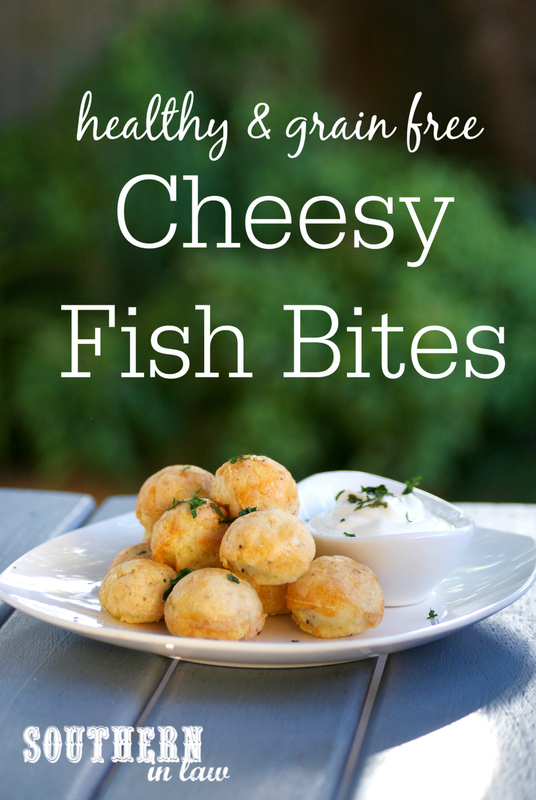 These cheesy fish bites were one of those recreations. Jesse and I were talking about what healthy fish recipes we could come up with for Lent as we've had lots of readers around the globe asking us for suggestions as they give up meat for the lent period. Jesse mentioned hush puppies and I was instantly inspired! For some reason I thought that hush puppies were some kind of corndog creation, however, Jesse told me they were basically fish in a cornbread batter that's deep fried. I decided I wanted to make a healthy hush puppies recipe, however, one of our readers had also asked me for low carb and healthy kid friendly fish recipes so I decided to combine all of those ideas into one to make these Cheesy Fish Bites! Made in a cake pop maker (or a mini muffin tin if you don't have one! 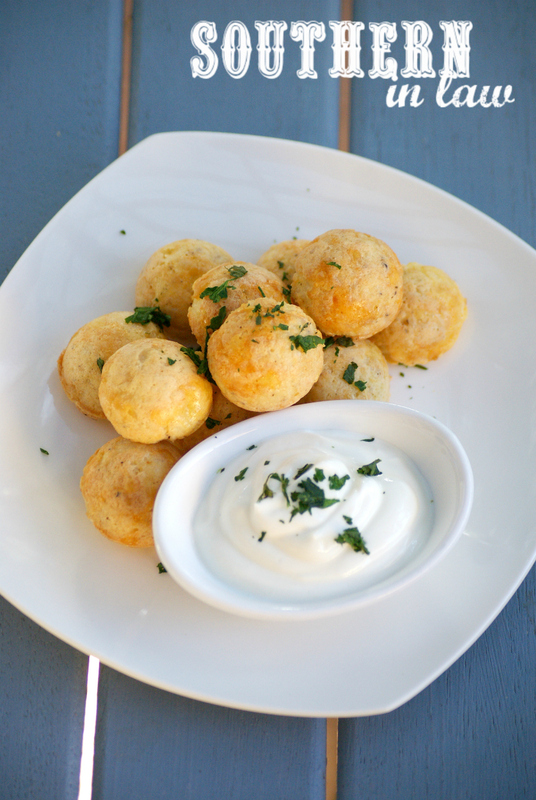 ), these bite-sized treats are seriously addictive and so much fun! 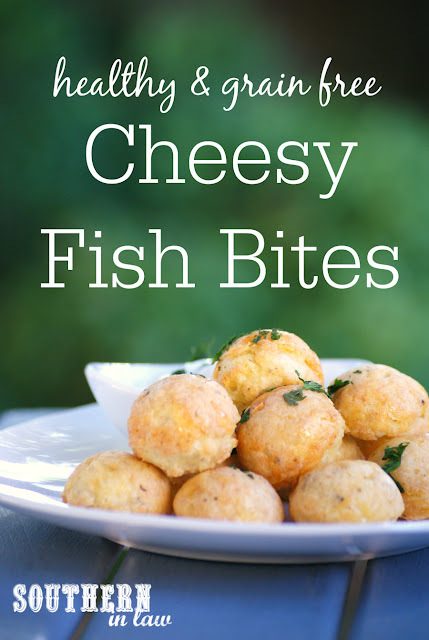 They've got a crunchy outside with a soft, fluffy interior - and even the most serious fish hater will find themselves reaching for more. 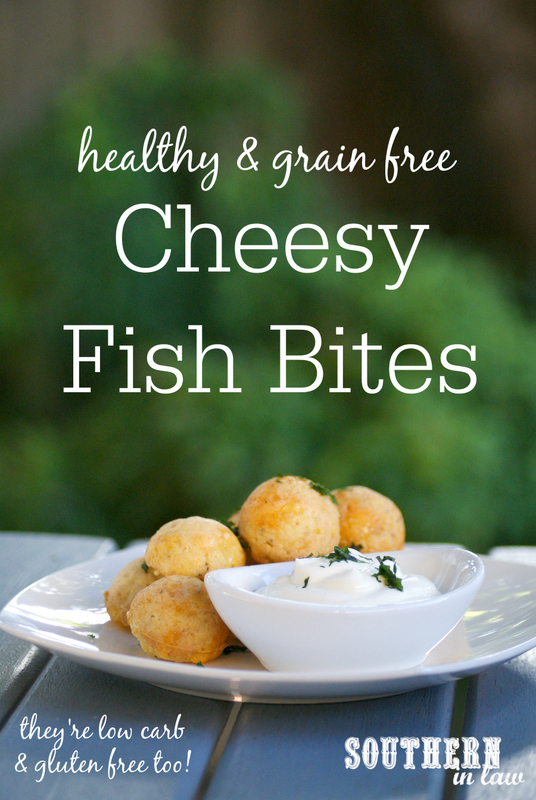 also known as Healthy Hush Puppies! To cook your fish: Bake at 180C/355F until cooked through and flaky (you can also grill it, however, we find it's softer and easier to mix through if baked. Let your fish cool for 5 minutes and then flake with a fork, breaking the fish into small pieces. Add in all of your other ingredients and mix until combined. Heat up your cake pop maker and lightly grease. Fill your cake pop wells just below the top and close the lid, cooking your fish bites for around 5 minutes or until golden. If needed, flip your bites over and close the lid again, cooking for another 1-2 minutes or until golden on both sides. If you don't have a cake pop maker you can bake these in the oven in a mini muffin tin at 180C/355F until golden and cooked through. Serve immediately on their own or with a dipping sauce of your choice! They're best eaten fresh, however, will also keep in the fridge in an airtight container for 2-3 days. But tell me, what are some foods you remember from your childhood? And what's the most unusual food you've ever tried? I haven't really tried too many unusual foods as I was never an adventurous eater as a child and now have too many food intolerances, however, Jesse's Dad once offered me turtle for dinner :P I thought that was pretty odd!